Imported smoked baby clams are a delicacy that are perfect for appetizers or simply as a snack. Can be consumed with crackers or your favorite cheese. Add a sprinkle of your favorite Mexican salsa or bottled sauce and you have a great combination! 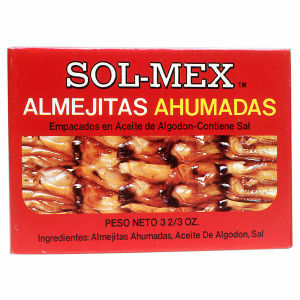 Part of the Sol-Mex family of high quality seafood products. Your satisfaction is guaranteed.